The families below, who have known surviving descendants*, are the offspring of children of respectively Malcolm, Angus, Martin, three of the sons of Duncan & Mary (see Early Recorded Generations 1-3 for preceding lines). * We have no known surviving descendant of Duncan & Mary's youngest son, John . In an effort to find such survivors, some of whom are likely to be in the U.S.A., all known descendants of John are included below. See the Generations Chart for an illustration of family relationships. Family of Hector  & Elizabeth Macleod . Hector & Elizabeth had four sons. One son, Malcolm  died of consumption aged 19 in 1878. John,  the youngest, married Mary MacKinnon . She died aged 30. They had a daughter, Betsy; it's not known whether Betsy had any offspring. Duncan McPherson , their eldest son, was born on 26 July 1855 in Tarskavaig, Sleat, Skye. In 1888, he married Margaret Nicol Marshall , daughter of Alexander Marshall, minister of Cumbrae, Ayrshire & Margaret Jessie (Begg) Marshall. Duncan was living in Duke Street, Glasgow and Margaret was in Albert Drive.They were both described as teachers. There is an unsubstantiated family story that Duncan went to university. He was described as an Elementary School teacher in the 1891 census, living with his wife at Marchmont Terrace, Cathcart, Glasgow. Ten years later, they were at 78 Grange Road, Cathcart. Their neice, Betsy, daughter of John & Mary, age given 10, was also living there. 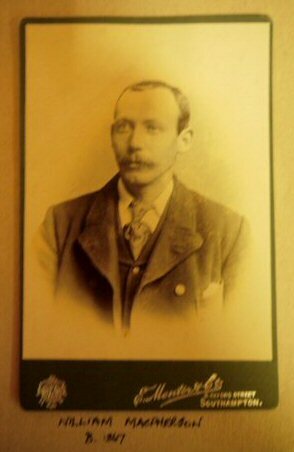 Duncan died on 16 June 1908 at 38 Leven Street, Pollokshields, Glasgow. He was described as a Public School headmaster. His wife, Margaret, died on 26 June 1926 at Leven Street, aged about 64 years. 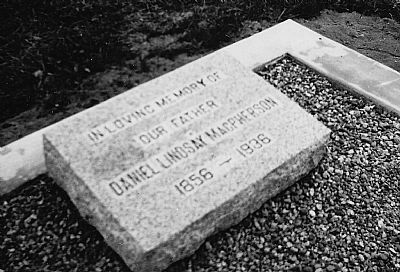 Donald Lindsay MacPherson  was the second son of Hector & Bessie.He was born on 13 December 1856 in Tarskavaig, Sleat, Skye. He trained as a teacher (using Gaelic...there is an unsubstatiated family story that he went to university). In 1879, Donald moved to the Isle of Harris. The following year, he married Marion Sarah McLeod , daughter of William & Catherine (Campbell) McLeod, in Tarbot (Tarbert, Harris). In the 1881 census, the family, including baby Malcolm, were at 25 East Tarbert. Donald was described as 'merchant grocer'. In 1886, the family, now with three surviving children, emigrated to Canada. They were accompanied by Marion's brother, John Bannatyne McLeod, his wife Annie, and infant Willie. 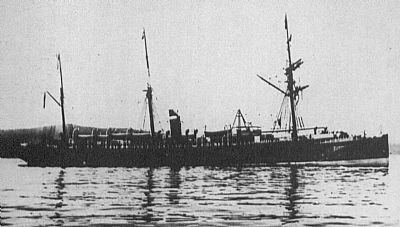 They sailed onthe 'Buenos Ayrean' from Glasgow and arrived in Quebec City on 3 June 1886. They settled six miles from the town of Craven, Saskatchewan (then part of the Northwest Territories), and Donald resumed teaching. They lived there for seven years and had four more children; the last, Bessie, was born and died in 1893. In 1893, they moved to near Willow City, North Dakota, U.S., where they took up farming. Their children went to school in summer, but lessons ceased in the winter cold. Nine year later, the family moved back by train across the border to Coquitlam, British Columbia, where Donald worked as a bookkeeper for a department store in New Westminster. Marion enjoyed living here by the ocean, reminding her of her Harris homeland. In 1906, they moved again, east to the Flagstaff district of Alberta, to farm. Malcolm, their eldest son, was already settled there, together with Marion's brother John (J.B.) McLeod and his family. Donald had to build a new house, after his first had burned down due to a faulty stove. 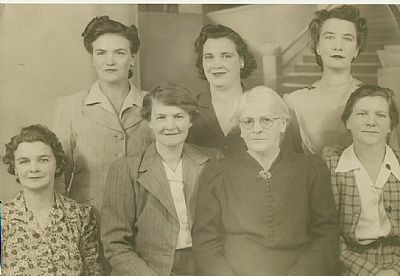 Donald and Marion had eight children, six sons and two daughters. Four children were born in Scotland (William died in 1883). Marion passed away on 1 January 1917 in Alliance, Alberta, and was buried in Merna. She had many friends and was well-known throughout the district as a mid-wife. Donald (also recorded as Daniel) continued living and farming in Flagstaff until 1920, when he moved back to British Columbia and bought an acreage near Haney, accompanied by his son, Donald William. 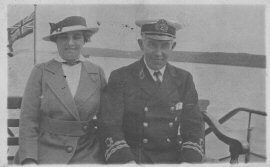 In 1926, Donald/Daniel married Margaret Ellen Taylor , a widow from England, in Vancouver. Donald died in his 80th year at Haney, British Columbia, on 16 September 1936. He was buried in Maple Ridge Cemetery, B.C. Family of Duncan  & Mary  (MacDonald) McPherson. Duncan & Mary had six children - John, Mary, Alexander, Isabelle, Sophia & Angus. The two older children were born in Sleat, Skye; the other children were born in Australia. John McPherson (557), son of Duncan & Mary MacPherson, was born in Sleat, Skye in 1848. He emrigated with his parents and sister, Mary, to Australia in 1854. In July 1878, John married Louie Agnus Clare Hiley (639) in Albury, NSW. Her parents were Henry & Louisa (Hales) Hiley. John & Louie had two children. John, who was a farm labourer, died possibly of anthrax in Wilcannia, NSW, in 1881 aged 33. His widow, Louie, died 50 years later in Burwood, NSW. Alexander MacPherson , son of Duncan & Mary McPherson, was born in Geelong, Victoria, Australia on 1856. He married Louisa Lydia Harvey  in 1899 in Mullengandra, NSW, Australia. They had seven daughters and five sons. Alexander died in Albury, NSW, on 10 Nov. 1923. Louisa died in Melbourne in July1951. Sophia (580), daughter of Duncan & Mary MacPherson, was born in Geelong, Victoria, Australia in about 1860. She married William Rixon (616) in Albury, NSW, in 1887. They had 6 children. Sophia died in Manly, NSW, in 1937. Duncan & Mary MacPherson's youngest child, Angus (581) was born in 1862. He married Ada Harriet Harvey (638) in Albury, NSW, when he was 36 years old. They had two daughters & two sons. Subina/Sibildh [141 MacPherson, third daughter of Donald & Chirsty MacPherson, was born in Sleat on 27 Oct. 1867 and married Malcolm Robertson  in 1890. Subina & Malcolm were first cousins (Malcolm was the son of Effy  MacPherson, Martin's daughter, and Donald Robertson). They had one son. The family lived in Sasaig where Malcolm was a crofter. Malcolm died in 1941. Subina died in 1955. Farquhar  McPherson, Donald and Christy's younger son, was born in 1876. He married Aby (Barbara) McPherson , daughter of Malcolm and Margaret (MacGillivray) McPherson (see headstone image). Aby was known as Aby Challuim (from her father Malcolm/Callum). Farquhar & Aby married in Kelvin, Glasgow in 1917. However, their family home was at 3 Duisdalebeg. They had three daughters. Aby & Farquhar both died at 53 Scott Street, Kelvin, Glasgow in 1956 & 1958 respectively. Farquhar was a retired railway loader. The eldest child of Effy & Donald, Malcolm  married his cousin Subina McPherson , daughter of Donald  & Christy (Robertson) . Their younger daugther Catherine  married Charles Brookes  in Glasgow in 1890. They had five children. Catherine died in Possilpark, Glasgow in 1943, age given 79 years. Duncan & Alexina had three sons, John, Angus & William, who became seamen, and four daughters. Three of the girls died young - Annabella Ann aged 19, Williamina aged 1 year, and Mary Ann, the youngest child, aged 6 years. John  McPherson was born on 11 Apr. 1857 at Ullapool, Ross & Cromarty. He was a seaman, spending his early career on sailing clippers, some under Captain Tannock of Saltcoats and the Allan line serving the cross-Atlantic trade. He was Chief Officer of the "Falklandbank". He obtained his Master's ticket in 1894. He sailed on the P & O cable ship "Monarch". For a time he captained the "Cambria" a tender to the Industrial Training ship "Empress" based on the Clyde. 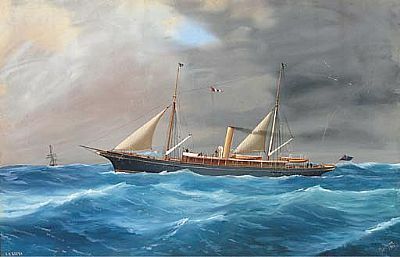 He started his connection with steam yachts at least as early 1898 ("Greta", ON105589). In WWI, he was appointed Lieutenant, Royal Naval Reserve in Feb. 1917. He was stationed at Milford Haven, west Wales, having taken the appointment on the suggestion of Admiral Charles H. Dare, commanding at Milford, whom he had met while sailing in the Mediterranean, and doing some monitoring of Greek fuelling of German shipping. 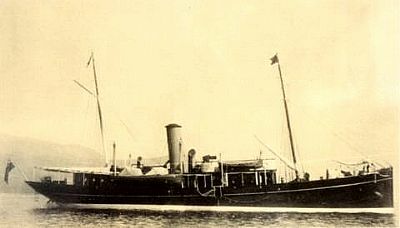 According to the Navy List 1919, he was in command of the Milford Haven Auxilliary Patrol ship "Idaho", a steam yacht. One of the aims of the Patrol was protecting the southern Irish Sea from U-boat attack. He was associated with the steam yachts "Greta" and "Beryl". Steam yachts were often luxuriously appointed for recreational sailing on the west coast of Scotland and in the Mediterranean. 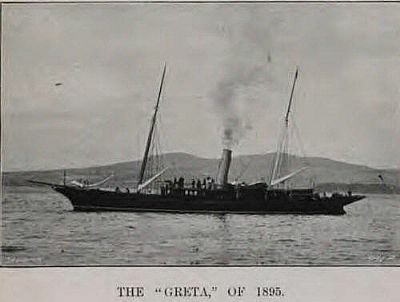 The "Greta" (300+ tons) was owned initially by John Scott C. B., the Greenock shipbuilder, through whose Halkshill estate at Largs, the Greta burn flows as a tributary of the Gogo Burn. He also sailed for Sir William Agnew, proprietor of the "Punch" magazine, whose yacht in 1910 acted as tender to the famous racer "Westward", owned by American A S Cochrane, and unbeaten in European waters in that year. His last post was as sailing master on the "Beryl", owned by Lord Inverclyde, whose gtgrandfather, Sir George Burns, was founder of the Cunard shipping line. Captain John brought the Beryl back from the U.S. in 1926, after its purchase by his employer. In Grangemouth on 26 July1888, John married Wilhelmina/Williamina 'Minnie' Noble  (1864-1919), daughter of John & Isabella (Greig) Noble, Fraserburgh. Minnie's father was also a master mariner. They had 6 sons & 2 daughters. In the 1890s, the family moved from Grangemouth to Largs. From 1919, John was a widower. He died at 15 North Gardner Street, Glasgow, on 17 October 1927, aged 70. Not long before he died, he had written to his brother Angus (see Library). 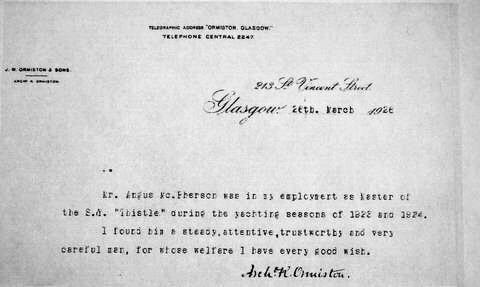 A letter of condolence from Lord Inverclyde to Miss MacPherson (probably John's daughter Isa) is also available on the Library Page. "Captain M'Pherson saw the passing from the seas of the clipper ships and the rising to their apotheosis of the racing yacht and the palatial steam yacht, and in so far as it was possible to make up to such a man for a loss so serious, the fairy-like racing craft and the marine palaces did so." (Extract from an obituary). Angus , John's younger brother, was born in Ullapool on 30 March 1859. A few years later, the family moved back to Skye. Angus, in common with his brothers, was a seaman. Little is known of Angus's early career. By the 1880s, he was an Able Seaman sailing world-wide on fully-rigged sailing ships and early steamships. The earliest record available is a Certificate of Discharge dated 1881 that shows he sailed aboard a Canadian immigrant ship the SS ' Waldensian'. 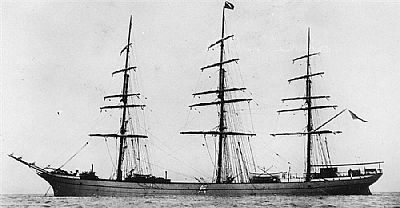 Sailed from the Tail of the Bank [off Greenock in the Clyde estuary] on the 19th of April 1884 bound for Valparaiso Chile. Got our orders for a place called Antofagasta in Chile, laid there for almost eight weeks, discharging and loading a cargo of nitrates. We were seven weeks of the Pitch of the Horn [Cape Horn] trying to get round. So we left for home bound for Falmouth for orders. Got our orders for Dundee. We had a fairly good passage home about 90 days. That was the happy days. The next story was two years later and encompassed over two years of his life at sea. Sailed from Glasgow on the 12th July 1886 bound for Brisbane Queensland. Made a fairly smart passage out. The day after we arrived all hands left the ship. I knew there was a school mate of mine not far away so I found him out and was welcome for a few days. I joined a ship belong to Sydney N.S.W. made to voyage in her. She was called the George Thornton of Sydney. I left her at Bundaberg North Queensland and I went back to Brisbane and joined a ship called the Stanley of Kaipara New Zealand also made to voyage in her and left her at New Castle N.S.W.. I then joined main sky sail barque belong to Greenock called The Samarkand bound for San Diego South California and went from there in ballast to Adelaide Australia. We made a pretty long passage light wind and calms. The next thing we knew short of provision we came across a French mail boat bound for Sydney we got what we took to Adelaide [given stores for trip to Adelaide]. We got no cargo there, we were sent to New Castle to load for Callao in China. 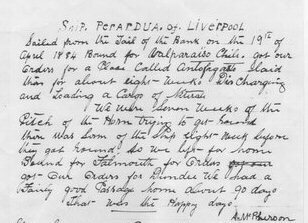 We laid there for about eight weeks discharging cargo and taking in ballast, There was five of us in hospital an Irish man, to [two] Blacks, the 2nd mate and myself. The Hospital was crowded with Chinamen but we were in the British ward and well treated. On a fine Sunday morning I saw the gate open and had a good look round and I got out side gate and ran on board the ship. Those I left behind didn't know what happened to me. We left the poor Irish man in Hospital. We now left for Portland Oregon. A month out from Calloa we ran into a hurricane. We had our sails blown away. The ship was hove down on her beam ends [lying on her side] for three days, all hands down below night and day trying to get her up right [by shifting the ballast]. On the 3rd day we bent on more sails. So we were on our way again and arrived all right and got our ballast out and started loading for home. Bound for Queenstown [Ireland] for orders. The ship was out for twenty five month and a half. So the articles were up [signed articles as crew had expired] so we wanted to get paid of in Queenstown. Went ashore and saw the Shipping master but he refused to pay us of. So we wired to Sir Thomas Gray in London. He was the head of the Board of Trade at that time. He wired back at once and said the crew of the ship Samarkand can demand to be paid of at Queenstown and after we didn't get paid of. Then we up to Cork and got a lawer [lawyer] all hands came ashore out of the ship and the Capt. after us on the street to go on board after getting his orders for Liverpool. So then we went on board quite happy. Got paid of in Birkenhead with £52 pounds. I could tell a lot more of what happened in this ship and still she was a happy ship and a good ship. Another tale by Angus relates to his times on the sailing ships 'Pass of Leny' and 'Aigburth' in 1891 [see Library pages]. Although Angus named 25 steamships he had sailed on, there is no story of any of them. It is obvious that he found the great sailing ships of the period far more interesting. In 1901, Angus had the foresight to enter a feu charter with Lord MacDonald for land he wanted in Kyleakin, above the edge of the waters of the Kyle looking onto Kyle of Lochalsh and further down the Loch.. Here he built Cliffe Cottage (The Cliffe), where his children were later born. At the age of 44, Angus married Marion (Morag) Macleod , daughter of Neil & Catherine (McInnes) Macleod, Bernisdale, Skye, on 25 March 1903 in Bridge St., Gorbals, Glasgow. Morag's father was coachman to the Macleod Clan Chiefs, and he was educated with the Chief's family. In the 1901 & 1911 censuses, Angus was visiting the home of his sister, Jessie Parker, in Glasgow. When he finally retired from his deep sea career, Angus put his considerable knowledge of seamanship to good use. He became a yachtmaster to wealthy owners of sail & steam yachts. For example, he was given a letter of recommendation in 1896 by George Moir, mine owner, for whom he was yachtmaster for three seasons. 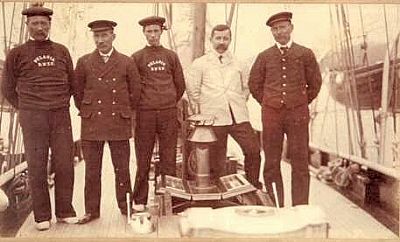 The photo below shows him (2nd left) as skipper with the crew of the yawl 'Pelagia' owned by T. G. Wotherspoon. 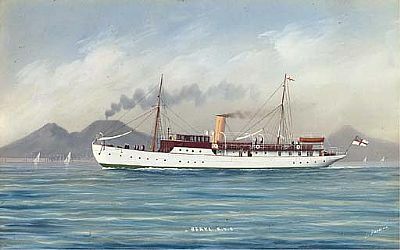 Angus also skippered the steam yacht 'Thistle' (below). 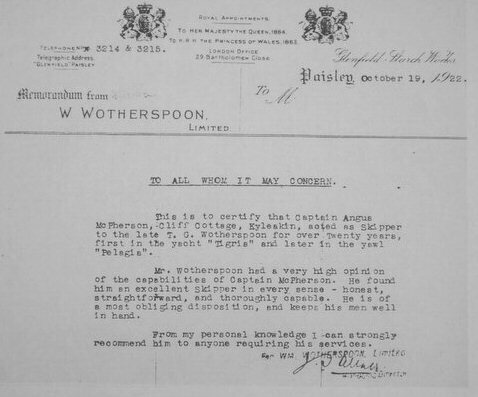 Letters of commendation by two his employers, Wotherspoon and Ormiston are in the Library. Angus died at home in Kyleakin in April 1949. His wife, Morag, died in Glasgow 15 years later. They were survived by their seven children, who had been born at The Cliffe at two year intervals - Catherine, William, Neil, Donald, John, Alexandrina & Angus. Jessie , Duncan & Alexina's second daughter, was born on 14 May 1863 in Lochinver, Sutherland. 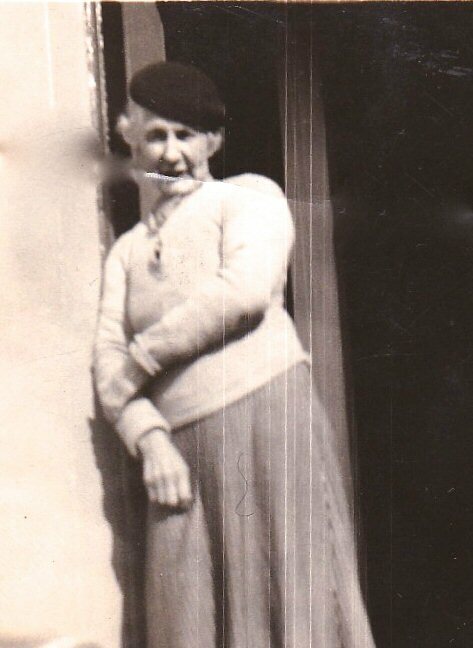 She was described as a dressmaker, given age 28, staying with her parents at Blackburn St., Govan, Glasgow in 1891. She married Thomas Garner Parker  (known as Garner), born in England, son of William & Ann (Garner) Parker, on 7 September 1897 at 3 Jane Street, Glasgow. In 1911, Jessie was at 80 McLellan St., Govan, with her step-son Garner, given age 17, apprentice sawyer, her daughter Alexandrina (Ina) and her visiting brother Angus, seaman. Jessie died at Walton Street, Glasgow aged 76 in 1939. William , Duncan & Alexina's youngest son, was born in Portree, Isle of Skye, on 16 February 1867. He was a seaman & unmarried. ".....We got a wireless on our way home about the "Lusitania" wasn't it awful we thought they would have us to[o] we had every thing ready all the boats swung out & lowered to the rail all ready for to get into but we saw none. Mostly every steamer that was meeting us had a big gun over the stern likely we will get one here. And Italy is starting now it is awful. Johnnie himself wont get much peace. Is Willie writing you. If spared when we get to the Clyde she is to load again for Calcuta. I am sure I will have to make another trip in her. That is tif they don't take us to the front, they will have to take old men yet before it is finished. I hope you are all keeping well. What a lot died in Kyle since I left & Bob Morris is dead. The Suez itself is turned upside down nothing but trenches & soldiers. There are a few French man o' war there. I don't think the Turks will come near it any more....". Willie died on 13 October 1923 in The Royal South Hants & Southampton Hospital, following a fall from the yacht 'Yinita', while it was lying in a yard at Northam, Southampton. On his death certificate, William was described as a yachtsman, living at 33 Smith Street, Glasgow, his parents' former home (understood to have been renamed Middlesex Street, which is near Paisley Road West in Kinning Park). He was buried with his parents in Sighthill Cemetery in Glasgow. James Macinnes McPherson , born 22 October 1859 married Maggie Campbell (b. abt. 1858), Isle of Eigg, in February 1896 on that island. After Maggie had died, he married Janet Macdonald (b. abt. 1863 in Glenelg), in Pollokshields, Glasgow, in December 1918. James died on 16th March 1943 in Waterloo, Strath, Skye. Janet died in Kilbride, Strath, on 4th December 1952. John  was born on 27 January 1862 at Kilmore, Sleat, Skye. His early years were spent in Ferrindonald, Sleat. He was a shepherd, crofter and stone mason, known as 'Shonnie Clacher' (Gaelic; John the Stonemason).. He married Janet Macinnes  on 5 November 1891 at Lower Breakish, Strath, Skye. Janet was the fourth daughter of John & Mary Macinnes, 34 Lower Breakish. By 1905, John had built the family home at 12 Camuscross, Sleat called 'Cnoc Olaig' (Christmas Hill). He also built a croft house at 24 Camuscross. Prior to moving to Camuscross, the family lived at Duisdalebeag. John & Janet had nine children, five of whom were girls. Cnoc Olaig was traditionally built from stone with a thatched roof. In 1924, the family moved into the byre for the summer, while the roof of the house was taken off, and the house renovated into 11/2 storeys with a corrugated iron roof and skylights back and front. Further improvements occurred, including electricity supply in 1949, and the house remains within the family. John looked after the croft, cut peat, built dry stone dykes, and tended sheep and cattle till he was no longer physically able. Janet had a hard life on the croft. There was not a lot of time for child care, the younger ones being cared for by the older ones. All the water for the house had to be carried from the well on the next croft. Peats were carried home in a creel on her back, from Brae Ord, about one mile away. 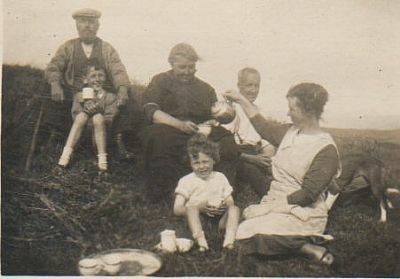 While walking to the peat bank, Janet's fingers were busy, knitting stockings for the family. During the summer, there was hay to be raked and stacked. Janet died in 1935 aged 66 years. John became bedridden sometime in 1947 and spent the last two years of his life there. His son Willie and his daughter-in-law looked after him. John spent his time in bed scanning the pages of a bible. This was not simply reading the pages! He did a detailed inventory. He found amongst other things...the shortest verse "Jesus wept. "; the number of times the word 'the' occurred (35543 times in the Old Testament and 10684 times in the New Testament); the numbers of letters, words and verses in each testament (3.5 million letters in total); the only verse with a hyphen - the Book of Exodus; the only verse containing all the letters of the alphabet - the Book of Ezra. All without a computer, or, indeed, electric light! John died at home in 9 March 1949, aged 87 years. Marion , John and Kirsty's only daughter, was born on 26th October 1863. She married Alexander Macdonald , a native of Benbecula, in the Gorbals, Glasgow in 1893. At that time she was a dressmaker and her husband was a railway surfaceman. In 1901 they were at 6 Marlow Street, Govan. Marion and Alexander had 3 sons and a daughter. Family of Duncan  and Mary  (Howard) McPherson. 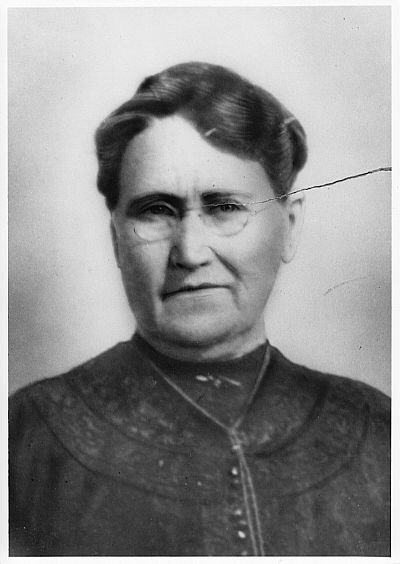 Rebecca , their daughter, was born in 1846. Family of John  and Elizabeth  (Rose) McPherson. Their eldest child, John  was born in New York in 1853. He married Mary Elizabeth Doty , born 1857. They had 5 children. John was a printer. 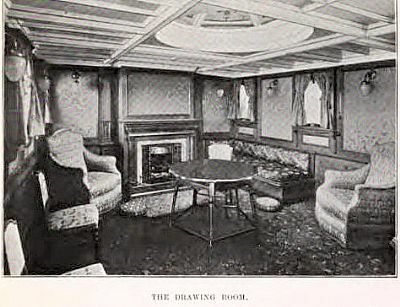 In the 1900 US. census, John & Mary with their married daughter Mary Dolan, grandson Clinton Dolan, daughters Grace & Ella and Mary's mother Mary Doty in Quenns District, New York. John & Elizabeth's only daugher, Cordelia  was born about 1855 in New York City. Their third child, Willy , was born in 1858 in New York. Willy married Lizzie Coyle . They had two children. Duncan , John & Elizabeth's youngest child, was born on 14 May1860 in Manhattan, New York. Duncan married Elizabeth Kane . They had 3 daughters and 2 sons. Duncan died in 1926 and was buried in Beechwood Cemetery, New Rochelle, Westchester County, New York. Family of Elizabeth  (McPherson) & Alexander McKay . Elizabeth and Alexander's eldest child, John  was born on 14 July 1858 in Govan, Lanarkshire, Scotland. In 1861, he was recorded staying with his grandfather John  and his two aunts, Isabella & Mary, in Sleat, Skye. John married Laura E. Hatton  on 12 January 1886 in Manhattan, New York. Laura, born in 1869 in New York, was daughter of William & Sarah (Berryman) Hatton. Ann(e) , Elizabeth & Alexander's eldest daughter, was born on 27 December 1859 at 31 Albert Street, Govan, Lanarkshire, Scotland. She died from measles on 24 May 1863 in Cathcart, Renfrew, Scotland. Mary , their second daughter, was born on 17 May 1861 in Govan, Lanarkshire, Scotland. In 1885, she was recorded at Warwick, Kent, Rhode Island. Their second son, William  was born in Cathcart, Renfrewshire (now part of Glasgow), Scotland on 23 May 1863. He was recorded living in Rhode Island in the 1870 & 1880 US. censuses. Isabella  , their fifth child, was born on 28 December 1864 in Cathcart, Renfrewshire (now part of Glasgow). She was recorded living in Rhode Island in the 1870 US. census. Their third son, Alexander  was born on 11 November 1866 in Cathcart, Renfrewshire (now part of Glasgow). He was recorded living in Rhode Island in the 1870 & 1880 US. censuses. He married Annie Morrison . Duncan , their fourth son, was born on 17 August 1868 in Bridgetown, Glasgow, Scotland. He was recorded living in Rhode Island in the 1870 & 1880 US. censuses. In 1900, he was staying with his brother, Matthew at Saratoga Springs. Thomas  was the first of their children born in the U.S.A on 25 May 1870 in Warwick, Kent, Rhode Island. He married Helena [surname ?] , born in New Jersey, and had one daughter. Their sixth son, Matthew , was born in 1872 in Massachusetts, U.S.A.. In censuses from 1892, he was recorded at Saratoga Springs. He married Jennie May Burdick  who had been born in New York in 1879. They had three children. James W. , Elizabeth & Alexander's youngest child, was born in Norfolk, Massachusetts on 15 September 1874.